LOS ANGELES – Leading DJ technology brand Pioneer DJ has licensed its PRO DJ LINKTM network system to media and real-time visual processing specialist ArKaos … to assist artists, music makers and visual creatives in bringing amazing, vibrant and fluid visual effects to DJ performances, which can come alive with exciting, hypnotic visual effects. PRO DJ LINK enables lighting, video displays and pyrotechnics to be synched with audio tracks that are being played via a professional DJ set-up. Widely used by DJs at major shows, events, festivals and clubs worldwide, this set-up will typically include Pioneer DJ’s massively popular CDJ-2000NXS2 Pro-DJ multi player and their DJM-900NXS2 Pro-DJ mixer. ArKaos can now connect its powerful and popular GrandVJ product to the PRO DJ LINK network using a new specialized App, the PRO DJ LINK Bridge. The App, which also supports scratching, unleashes the full potential of seamless syncing between visual effects and DJ performances, enabling DJs, event producers, lighting designers, LJs, video creators and VJs to blow away, impress and WOW audiences with incredible, mesmeric multi-sensory live experiences! Thanks to integration with the Bridge in GrandVJ, visuals can run in perfect harmony, ‘live’ with the music. All lighting and pixel fixtures and video display elements running via Kling-Net, Art-Net, etc., plus any 3D objects that are mapped using the ArKaos Video Mapper for GrandVJ XT can pulse, move and groove to the beat. 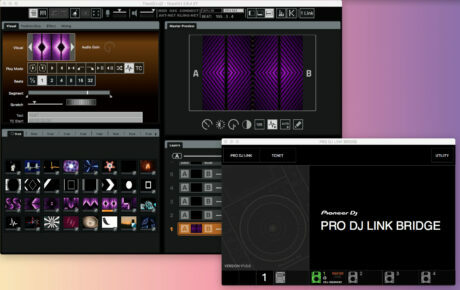 GrandVJ is a ground-breaking live video mixer developed by ArKaos for VJs, DJs, clubs, and musicians. This VJ software runs on macOS or Windows, utilizing MIDI and state-of-the-art live video technologies.